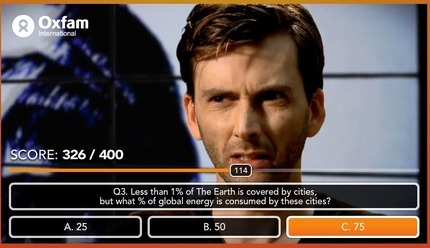 Everybody’s favourite TV geek crush, David Tennant of Dr Who fame, has joined up with Oxfam to offer an online climate challenge. You must guide David to answer questions about climate change, and pick the correct option out of three or four answers. Watch David Tennant screw his face up as he tries to figure out how many wind turbines China builds every day. You make the celeb answer by clicking one of the three or four answers, you get a mark for what time you chose it in, and then the celebrity says your answer. Other stars involved include: Ashley Lensen, Mackenzie Crook and Miranda Richardson. Games include: Boiling Point; Trains, Planes and Bananas; and Pollution Solution. There’s a button to sign an Oxfam petition on climate change and an option to share the game on your Facebook account. Oxfam have also hooked the climate challenge up with Nokia phones, so it’s available as an Ovi app. It’s a moreish way of getting people to swallow some hard facts on Climate Change.